Mr. Abadzadesahraei is a PhD candidate and researcher at the University of Northern British Columbia (UNBC). Sina completed his master's degree in water resources at the University of Algarve, Portugal, and received his bachelor's degree in Agricultural Engineering (Branch of Irrigation) from Iran University. He has been involved with numerous municipality projects as an Advising Green Space Engineer designing green space for public recreation areas and gardens. Sina moved to Canada in 2012 and has been involved with various researches and has held several positions. Sina joined an environmental consulting company as an environmental scientist for one year. He has had the opportunity to work on numerous environmental site assessments, primarily at upstream and downstream petroleum facilities, but also on several residential, commercial, and industrial lands. In 2013, Sina joined the Northern Hydrometeorology group (NHG). He has been involved with several projects. He has been investigating the water budget of Coles Lake, in northeastern BC. This work has been conducted in close collaboration with an industrial partner (Quicksilver, an oil and gas company) and the BC Ministry of Forests, Land, and Natural Resources Operations. This research aims to determine what amount of water can be safely extracted from Coles Lake for hydraulic fracturing ("fracking") by our industrial partner without damaging the environment. Further to this, Sina has been subcontracted to conduct field experiments at Coles Lake with the support of the BC Oil and Gas Commission. This experience has provided him with a strong skill set in the fields of hydrometeorological data acquisition and analysis, computer programming and statistics, preparation of technical reports, and use of state-of-the-art field equipment and data loggers. Furthermore, Sina's widespread academic and research background as well as his extensive field experience, have provided him with a solid understanding of behaviour-based safety awareness, program implementation, and insight into quality data collection. Sina has been involved in many high quality professions that emphasized strict confidentiality and professionalism such as the Director of Students Affairs and the PhD representative in the Graduate society at UNBC. 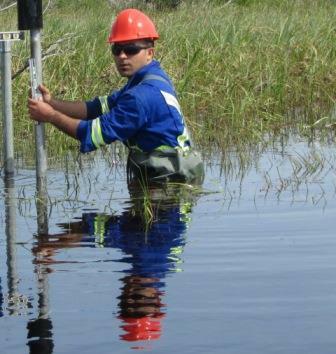 His research interests involve studying hydrology, watershed management and surface and ground water modelling. He has had several full teaching assistant and lab instructor positions at UNBC. Sina is not only active in academics, as he is also the karate instructor at the Northern Sport Centre. Climate research has repeatedly identified strong associations between anthropogenic emissions of ‘greenhouses gases’ and observed increases of global mean surface air temperature over the past century. Studies have also demonstrated that the degree of warming varies regionally. Canada is not exempt from this situation, and evidence is mounting that climate change is beginning to cause diverse impacts in both environmental and socio-economic spheres of interest. For example, north-eastern British Columbia (BC), whose climate is controlled by a combination of maritime, continental and arctic influences, is warming at a greater rate than the remainder of the province. There are indications that these changing conditions are already leading to shifting patterns in the region’s hydrological cycle, and thus its available water resources. Within this context, northeastern BC is undergoing rapid development for oil and gas extraction: this depends largely on subsurface hydraulic fracturing (‘fracking’), which uses enormous volumes of freshwater. While this industrial activity has made substantial contributions to regional and provincial economies, it is important to ensure that sufficient and sustainable water supplies are available for all those dependent on the resource, including ecological systems. This in turn demands comprehensive understanding of how water in all its forms interacts with landscapes and the atmosphere, and of the potential impacts of changing climatic conditions on these processes. The aim of this study is therefore to characterize and quantify all components of the water budget in the small watershed of Coles Lake (141.8 km², 100 km north of Fort Nelson), through a combination of fieldwork, observational data analysis, and numerical modelling. Baseline information generated in this way will support assessment of the sustainability of current and future plans for freshwater extraction in the basin by oil and gas industry, and help to maintain the precarious balance between economic and environmental well-being.